I have been reading your blog now for about 1 year. I’ve seen you address my question a few different times but I thought I would bring you directly into my situation. I am a new leader (about 8 months) who is managing people much older than myself. The twist is that I used to be one of their peers. How do I motivate/change behaviors that need changing without “selling out”. 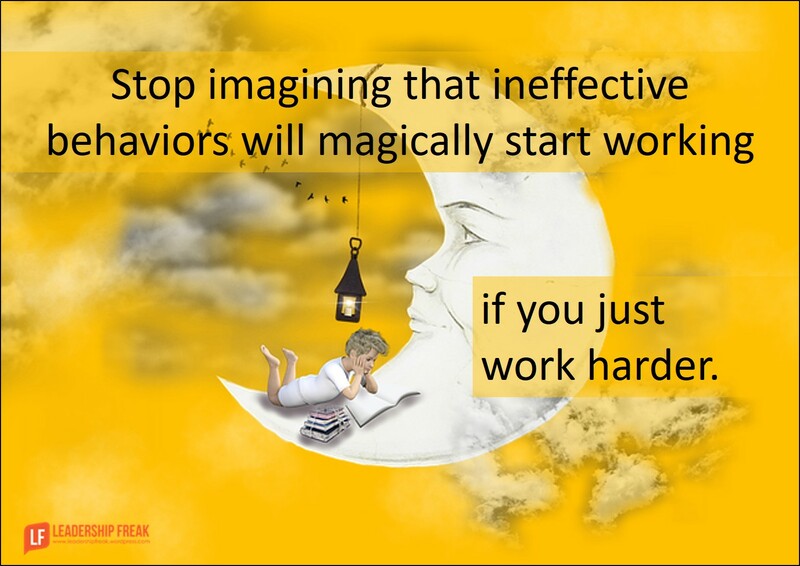 There are fundamental changes that my managers are requesting but I feel like I am just beating my head against a wall to get people to modify their behaviors. Thanks for reading Leadership Freak. Even though I’ve addressed this issue before, it’s different when you’re in the thick of it. The first thing I feel is the tug-of-war between upper management’s requests and people on the floor. There is a temptation to make one group the good guys and the other bad guys. You lose when you back-stab one group to connect with another. You come off as weak and ineffective when you back-stab one group to connect with another. You also validate the bad attitudes you’re working to overcome. The second danger you face is sincere blind persistence. What do you know when you’re beating your head against the wall? Whatever you’re doing isn’t working. Be persistent with goals. Adapt methods. Reconnect with former peers. I bet you had strong relationships with some of the people on your team when you were their peer. It’s to your advantage that they are much older. Approach them as if they were your parents or grandparents. Seek and take their advice unless it causes damage. Let them know when you’re following their advice. Talk about why it matters. Purpose fuels passion. What’s important about this work? In order to see what matters, you have to get out of the weeds and see the big picture. Begin small. Work with former peers who respond positively to your leadership. A small group of influential allies may begin turning the tide. Be kind. Don’t be weak. Keep upper-management in the loop. Let them know what you’re doing. Tell them your future plans. Disagree respectfully. Speak your mind in private. Grab the rope and pull, even if you disagreed in private. Go back to #1 on this list. Think inspiration, not motivation. How might you tap into your team’s inner motivations? Seek many options from people outside your organization. Generate long lists of ideas that might move the agenda forward. Don’t wait for magic solutions. Stay positive. Express gratitude every chance you get. You face an important opportunity. Growing numbers of young people face the same challenges you face. Hang in there. Stay open. Practice optimistic transparency. What suggestions do you have for Unhappy Head Banger? Fantastic inputs for head banger! I am following your blog from March 2016 and find very resourceful. I am in same phase and find the tips very useful. This happens so often in education – with younger principals and veteran teachers. Veteran teachers are often perceived as not wanting to change, which can be said from time to time for any educator regardless of age. I really like the emphasis you gave to cultivating the relationships with the veteran staff. Whether pre-existing or new, relationships matter. Everyone wants to feel valued, so honoring employee strengths is a place to start. Then the changes that are needed will be easier to introduce and implement. Thanks Vicki. I think that we get so caught up in getting stuff done that we forget that everything goes easier when relationships are stronger. The keyword is to me is “change”, who needs to change and why? What us the goal of the change? The senior staff are there for a reason ask their input on both sides of the table. Do we really need change and restructuring the organization or is someone just pushing the buttons of others? Because they can. If it’s not broke don’t fix it! Identify what change is going to do for everyone involved, is this really a necessity? Your list of solutions should also be prepared for educated rebuttals that stymie the flow. And my deliverables (business) has also that much time to prove. Here there are quite a few bitter and sour experiences of the people and their belief system conditioned out of that is causing not much satisfactory results. How to change fully or partially their belief system? above article is surely useful, but anything apart from that if you can feed. Great insight! One thing you mention in this article happened recently in my organization with a supervisor, when he tried to empathize with the hourly group and misrepresent the company goals and mission. By doing this he never gained their respect. The craziest part of this scenario was that he didn’t even know it! He was a younger man in an older unionized shop. They were eating him alive, which honestly is expected. These older employees are going to challenge a younger inexperienced supervisor. Depending on the age differences, it would be good to build relationships based on what different generations value. Older generations value competence and troubleshooting ability, while younger generations may value freedom to be expressive. Understanding generational differences and what motivates them is huge when undertaking a position where you have senior employees reporting to you. I offer insights on becoming a first time manager and provide other helpful tips at bossinthemiddle.com. As usual your thoughts provide insight and practical advice. I faced a similar situation when I was in my twenties. Although I wasn’t a former peer, my team was small and I did some of the individual contributor work. In my situation, I wasn’t able to get the behavioral charge required until I was able to disrupt the group dynamic. In my case I had to move one of the senior “belly achers” out of the team. I was afraid that the team would revolt because she was very outspoken. It turned out that after she left the whole team reflected that her influence was “toxic” and change started to be much easier. I later learned that she flourished in her new role. Sometimes people get stuck and it takes a major disruption to break a log jam. At the time I thought I was taking a huge risk. Since then I have coached my teams to move on before they get stuck. It is great for their development. Love your insight here. One thing I would recommend is have team meeting. I found that when I started meeting with my staff of eight and everyone could share ideas and concerns everyone took an individual interest in making the team succeed.